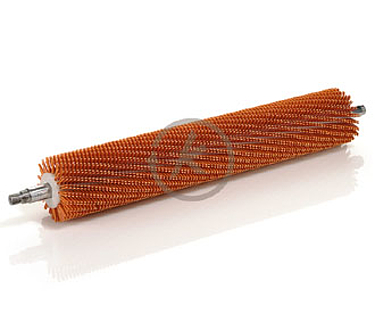 Roller brushes Type 422 with sub-bodies e. g. tubular cores with journals are defined as having a body length longer than 100 mm (for brushes shorter than 100 mm, see "Circular brushes"). The brush cores (plastic or wooden cores with mechanically anchored bundle of fill material) either are mounted on steel shafts (WK1) or Steel /stainless steel tabular cores with journals (WK1 resp. WK4) for strength and rigidity. The comprehensive range of dimensions, core materials, fill materials and fill configurations demonstrates the versability of Kullen-Koti again and again. We would be pleased to supply you on request with details of special designs with wood or metal bodies. In case of brushes with non-cylindrical cores, we would like to ask you to send us a drawing or simply discuss your requirements with our technical consultant. - High fill density EA1, - normal fill density EA2, - low fill density EA3. for wet or dry operation or for high temperature. Should you be in need of certified, electrodynamically balanced cores for a fixed rotation speed or other working conditions in your plant – we will do it to balancing standard G 2,5 (ISO 1940). Conveying machinery of all ind.